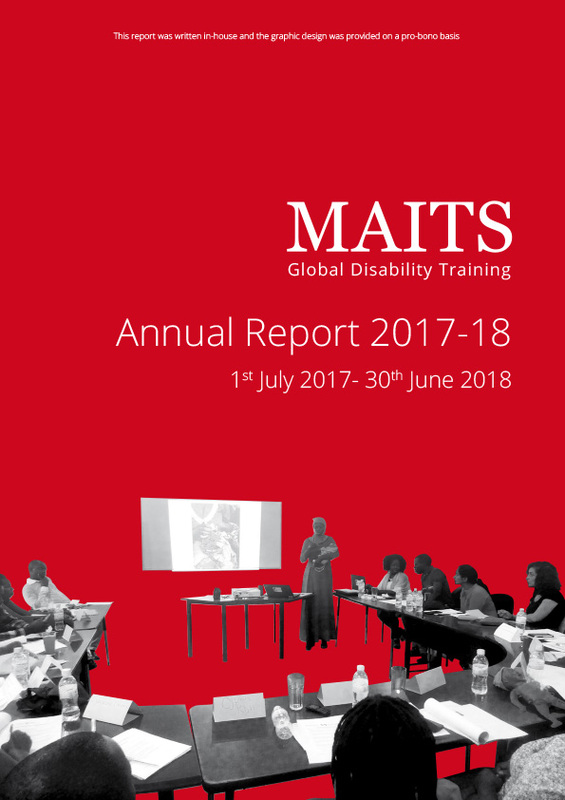 MAITS is an international disability charity, which provides free disability training in developing countries through a team of highly qualified volunteer therapists and teachers. We have worked in 20 countries around the world and have a team of healthcare and education professionals globally who volunteer their time to provide training and skill-building to those working with and caring for people with disabilities such as autism and cerebral palsy. We have reached over 1 million people with disabilities and their families since we were set up in 2008. Last year, our volunteers won three of the six Prime Minister’s Point of Light Awards for their voluntary work with us. MAITS has been solely funded by one main donor from its inception, but after an external review, we decided to expand our work and programmes and we have successfully secured funding from a range of different sources in the past two years. Demand for our work has increased and we have clear and ambitious fundraising targets to enable us to meet the demand for our work. Our current funding includes trusts and foundations, some corporates and crowd-funding. We are also planning to apply for institutional funding in the next year. We are looking for a dynamic, motivated person with excellent writing skills and previous fundraising experience from grant giving trusts and foundations, corporates and/or institutional donors. We are a small and friendly team and this role will allow you to build your experience in a range of areas of fundraising and maintaining donor relations. Reporting to the CEO, the fundraiser will be responsible for putting in applications for our programmes, which include infant feeding programmes, community health worker training, core funding and our volunteering grant programmes. You will also be responsible for conducting prospect research to identify new donors, maintaining a pipeline and recording applications and helping to predict income. Using effective prospect research, the Fundraising Executive Trusts and Foundations will identify potential new sources of income from appropriate grant giving bodies, put in applications and maintain good donor stewardship, as well as writing reports on how the funding was used. To research, identify and apply to trusts and foundations and other grant-making bodies across the UK, which are likely to support the work of MAITS. Using existing templates and materials produced by MAITS, as well as developing new ones to produce and submit funding applications to a range of relevant trusts and foundations, corporates and crowd-funding platforms. To put in funding applications for our programmes and core costs to a range of donors from trusts and foundations, corporates and crowd-funding. Working with the CEO to support her in larger applications to a range of donors, including institutional donors. To carry out prospect research and maintain a database to identify suitable donors for MAITS on an ongoing basis and a pipeline showing when and how much we plan to apply for from specific donors. To manage and nurture good relationships with donors through e-mail, telephone, written proposals and other forms of communication. To write and ensure timely submission of reports for trusts and other grant-giving bodies providing details of the impact of previous donations. To manage systems – including regularly updating the pipeline document of potential new donors and maintaining a spreadsheet/database of donors applied to and recording each contact with them. To maintain good relations with colleagues and external parties, to ensure that we capture the right information for funding proposals and the work of MAITS is well represented externally. Working with partners and programme staff/volunteers/consultants to help develop fundraising packages for new or expanded areas of our work for example for an expansion of our infant feeding programme or a larger volunteers’ package. As part of this role, you may be required to attend occasional events in the evening to promote MAITS work. Any other reasonable requirements as requested by your line manager. The post holder will work within all policies, procedures and budgets set by MAITS. The post holder will act at all times in the best interest of MAITS. The post holder will form effective working relationships with all staff members, volunteers and outside organisations as appropriate. The post holder must accept responsibility for ensuring that the policies and procedures relating to Health & Safety in the workplace are adhered to at all times. The post holder must respect the confidentiality of data stored electronically and by other means in line with the Data Protection Act. The post holder will not disclose to an unauthorised person any confidential information acquired through official duties unless they have received official permission to do so. Qualifications – educated to degree level or above, preferably in an international development or disability related field. We are looking for someone to work 18 hours per week spread over 3 or 4 days from MAITS London Office. There can be some flexibility with working hours. If you are interested in the position, then please apply by sending your up to date CV and cover letter addressing how you meet the person specification to info@maits.org.uk. The last date to apply is 30th April 2019 and then interview will be held in the week beginning 6th May 2019. The contract will start in June 2019. MAITS is a disability confident employer and MAITS takes its safeguarding responsibilities very seriously. All staff members and volunteers are subject to reference checks and any posts involving contact with beneficiaries are subject to Enhanced DBS checks[ . MAITS has a stringent code of conduct that representatives and employees must sign up to and we have made reporting of any safeguarding concerns mandatory and staff or representatives that fail to comply with this will be subject to disciplinary action.